Thank you for the stroll down memory lane. Yes, detail oriented indeed. It's fun reading back about the way things were. Eagerly awaiting the next Relix to scour the classifieds for new trading partners was always a treat. 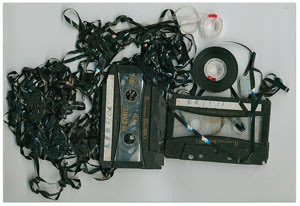 Compared to today's 'click and download' the tape trading seems so complicated and intense, yet so utterly charming and with a massive sense of community and belonging as well. I missed the tape trading scene, being a relative newcomer and finding nugs, gdlive and The Archive to fill my needs....but part of me wishes I could have participated in the tape scene. I'd love to see more posts about this. I'm just getting into the Dead (With no small amount of help from the Listening Trails) and the more AUDs I listen to the more intrigued I become by the culture that grew up around producing and trading them. These little details are fascinating. that was really a blast from the past! I remember painstakingly grading quality on all my tapes and typing up my tape list (yes, on a typewriter) to send out to prospective traders picked out of Relix classifieds. I was only 15 when I started so I never thought to photocopy and amend the list as my collection grew, so I would sit down and retype the list each time! I also became enamored with the different tape covers found on tour like the one you have pictured. I once sent $2 cash in the mail to a couple in Indiana(?) and they sent me something like 20 tape covers, each one different. great post! However fastforwarding was prohibited....don't want to expose the tapes to any possible snags. Decks had to be cleaned and demagnatized every week. And I never cashed in my 10000 Max points!!!!!! 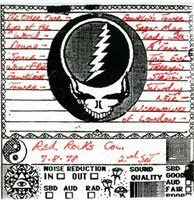 Back in the day, it's hard to imagine how much money I spent at Terrapin Tapes and Nak Dragon's. All for fading analog memories. I knew my postman by first name! He knew what was coming every day in those sealed envelops. For some lucky reason, I somehow befriended a few aud tapers from the 70's and early 80's who hooked me up with their masters, much to my delight. There was nothing like getting home from work or school, rushing to the mail box and pulling out a 1st gen of 12-3-81 and spending the rest of the evening reeling. Posts like this one on tape trading memories are expecially great since I've been tape trading in the 80s myself. Not Grateful Dead though but lots of what was called New Wave then. Means Talking Heads, B 52's, Gang Of Four, Elvis Costello etc. To have as many items for trade as possible I virtually taped every concert that was up on German radio and then typewrited my list over and over again. Glory days! Again: Thanks a lot for this blog!! As much as I love to reminisce about the "good ol' days" I am so grateful we've gotten to the point where shows are but a click away. I think about all the time I used to put into taping, mailing, networking - and realize that I couldn't possibly get the same rewards nowadays, with job, kid, and all of adulthood's accouterments. Not to mention the other bonuses of modern technology, like this here blog and podcast series! Recycling! I loved getting a mailer with an inch-thick worth of labels, addresses over addresses of heads who'd shared music in the very same envelope. Three-head decks. Though I could never enter the dragon, I was proud of having a Sony ES model with a dedicated recording head. Someone mentioned Maxell points. I haven't yet forgiven myself for never sending them in to get the wireless headphones. Lack of any consistent grading system. Would my A- tape sound as good as yours? Fillers! I had some amazing epiphanies come from the hidden gems kind souls would stick on tapes. As I gaze lovingly at my dusty Nak CR7A (save for the Dragon, arguably the best deck ever) I remember when trading was a social endeavor wrapped in solitude. The nights I frittered away with my decks making tapes for fellow heads around the country will never be replaced by the nights I leave my Mac on to download 40 shows from 1973. I'm slowly replacing my tape collection with their digital equivalent (1 Terabyte at a time!) But until then I still have the decks, the tapes and of course the J-Cards! That said, I probably listen to more now that I can download and play simultaneously.